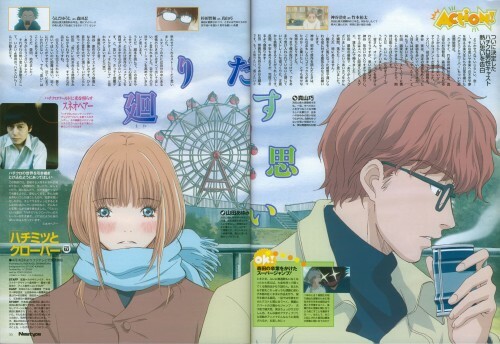 I think it's from a manga soon to be anime called Honey & Clover. It's shojo. Oh!! !I started watching this serie some weeks ago-Honey & Clover-It's really funny :D Those 2 fit very well!! This seems to have been overlooked by me until now. A true pity, since this is a very nice scan, from a very nice series. The argument about battleships touched my heart. Also, <3 Iron Lady. Thanks for sharing. a fine series that is worth watching again and again until nn eyes ache! thanks! very pretty, cute, cute!